On 08 January 2015, the US Department of Defense announced the consolidation of some U.S. infrastructure in Europe, including the return of 15 sites to their host nations. As a result of this announcement, DoD is to close two Baumholder Waterworks and return control of these to Germany. 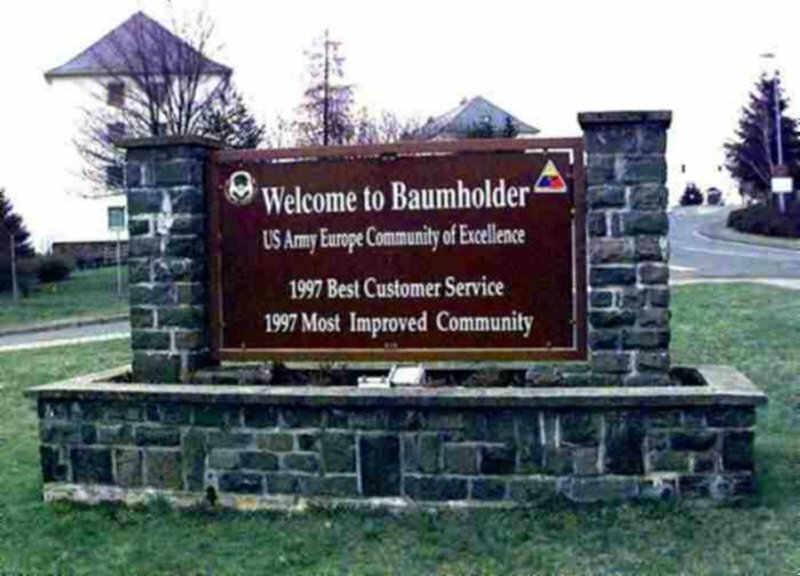 Baumholder is home to the largest concentration of US combat soldiers outside the United States. 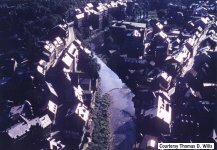 It consists of Smith Barracks (the main post) and the base operations area support teams of Strassburg in Idar-Oberstein and Neubrucke, near Birkenfeld. Baumholder is a VERY HIGH deployment post. 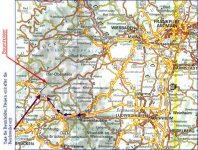 A major deployment to Kososvo and Macedonia, with participation of most Baumholder units, took place from November 2000 to July 2001. This deployment included 80 percent of Baumholder units. The American military community literally coexits with the city of Baumholder, as various housing units and post facilities are located in and around the city. Baumholder is located in west central Germany in the state of Rheinland-Pfalz, about 70 kilometers from the French border,about two hours from Frankfurt, just off Autobahn #62, and between Kaiserslautern and Trier. Baumholder falls under the 104th Area Support Group in Hanau, and the 222nd Base Support Battalion is the supporting and host unit for the Baumholder military community. It is the home for major elements of the 1st Armored Division, including the Division's 2nd Brigade and Division Artillery. Baumhoulder's primary mission is to support the 1st Armored Division. Other key units making their home here include the 8th Finance Battalion, Baumholder Health Clinic, Dental Clinic, 40th Engineer Combat Battalion, 47th Support Battalion, 90th Personnel Service Battalion, and three AFCENT units. Population assigned-served: 13,000 soldiers and family members. A full complement of support services and agencies, the majority of which are offered by the 222nd BSB, are available to the Baumholder military community. Complete support is offered from the day a soldier arrives in Baumholder until the day he or she departs. 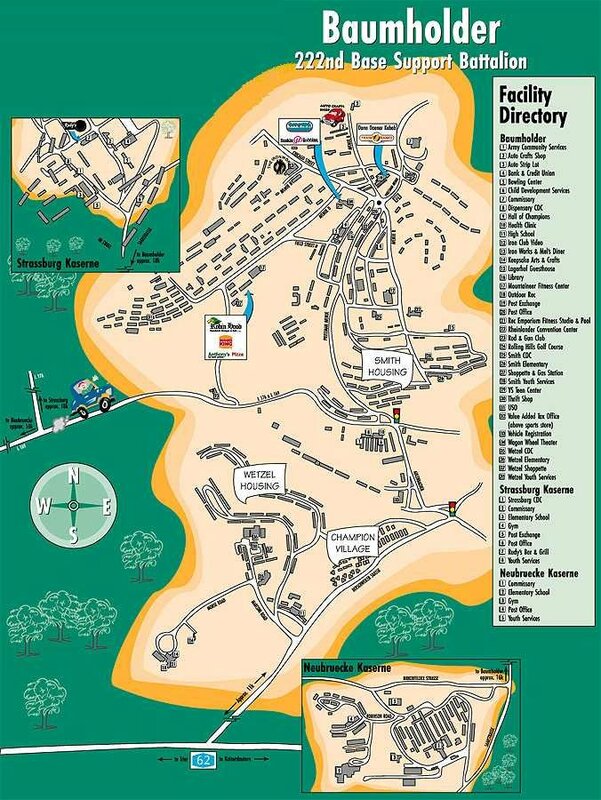 There's everything from medical and dental care, to morale, welfare and recreation facilities. Baumholder and its sister communities are rich with history. Baumholder itself has medieval origins, with the first recorded mention of the town found in a document dating back to 1156. World War II brought the military to Baumholder. The Third Reich needed a training area and Baumholder was picked. The German government appropriated 29,158 acres and resettled about 842 families from 14 villages to clear the land for use by the Third Reich. Thus was born Baumholder's Major Training area, used today for military training by Americans and a host of NATO countries. The French occupied the area in 1945, and in 1951 the Americans moved in. With the help of thousands of German workers, dwellings for American families were quickly constructed. Baumholder supports a local training area, indoor and outdoor ranges, Bradley platoon gunnery trainer, Stinger missile and M1 tank simulators, MILES warehouse, airfield, and a railhead solely for military use. The majority of the 1st Armored Division's hardware departed for Bosnia from the 222nd BSB's railhead. The American military community literally coexists with the city of Baumholder, as various housing units and post facilities are located in and around the city. Baumholder is located in west central Germany in the state of the Rheinland Pfalz, about 70 kilometers from the French border and about two hours from Frankfurt/Main. Baumholder is quite centrally located, with France, Belgium, Luxembourg, Holland, Austria, Switzerland and the Bavarian Alps all within a few hours' drive. Also Baumholder is located in the midst of several of Germany's grape-growing regions around the Rhein, Mosel, Nahe and Saar rivers. 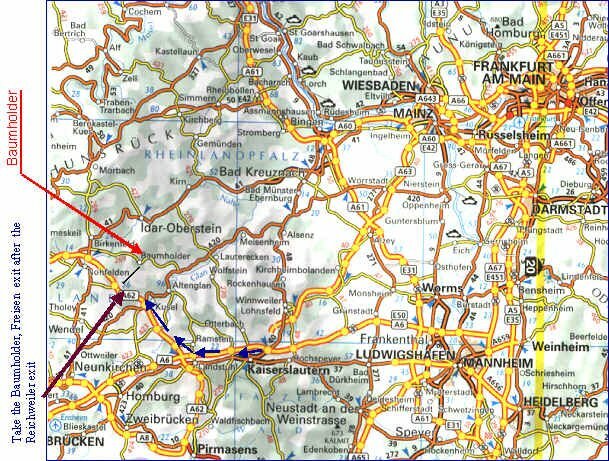 In fact, the Deutsche Weinstrasse, or German Wine Road, begins in Bad Duerkheim, only about an hour from Baumholder, and winds to the French border. Each region offers countless opportunities for wine tasting, and river cruises along many routes. Baumholder is a small German community. The area is hilly and has some beautiful scenic areas. Baumholder, the town, hosts weekly markets that sell fresh produce and baked goods at very reasonable rates. 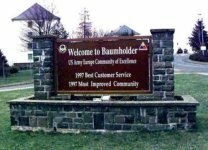 Baumholder is located within easy driving distance of both Ramstein Air Base, Landstuhl and Vogelweh Army/Air Force bases.